Understanding shoulder anatomy as well as the structures that are often injured can help in both prevention and treatment of sports injuries. The shoulder joint is commonly injured during sporting activities that involve the arms and upper body. Overhead athletes such as baseball players, swimmers, tennis players, and other athletes that use the upper extremities are often susceptible to numerous shoulder injuries. Shoulder anatomy starts with the bones that make up the shoulder joint. The shoulder joint is a ball and socket type of joint, with articulation of two primary bones, the humerus (upper arm), and the scapula (shoulder blade). The head of the humerus touches against the glenoid fossa of the scapula. Although this is referred to as a ball and socket joint, a better description of the shoulder joint would be to picture a basketball placed on a tea saucer. The shoulder joint in itself is a very mobile joint, allowing for motion in multiple planes in a very wide range. However, with this mobility comes decreased stability, and shoulder instability problems are common athletic injuries. The ligaments are an important part of shoulder anatomy. The primary static stabilizers of the shoulder joint are the ligaments of the shoulder capsule. The joint capsule surrounds the entire humeral head, and attaches it to the shoulder blade. Within the shoulder joint capsule, there are areas of thickening, which are referred to as ligaments. The primary ligaments of the shoulder can be divided into anterior (front), posterior (back), and inferior (bottom) ligaments. These areas of the shoulder capsule become tight at different ranges of motion, providing stability to the shoulder joint during activities. Next in shoulder anatomy is the muscles. Shoulder stability is highly dependent upon the muscles of the shoulder, specifically the rotator cuff muscles. The rotator cuff is comprised of four seperate muscles, all originating from the scapula and inserting on the humeral head. The rotator cuff muscles can be classified by their positions on the body. The posterior rotator cuff includes two muscles on the back of the shoulder. The infraspinatus and the teres minor. These muscles are responsible for external rotation of the humerus. The superior rotator cuff is found on top of the shoulder, and includes the supraspinatus. 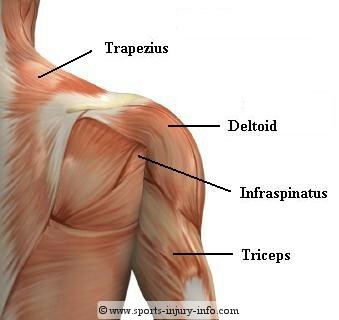 This muscle is commonly injured with a rotator cuff tear. The third and final group of rotator cuff muscles is the anterior rotator cuff, which includes the subscapularis. 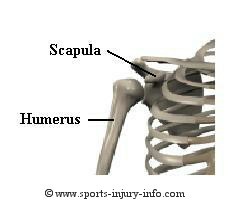 This muscles sits on the front of the shoulder, and causes internal rotation of the humerus. Together, the rotator cuff muscles help to keep the humerus centered in the glenoid fossa, and to provide stability to the shoulder joint during activity. Other muscles that play an important role in shoulder stability include the scapular stabilizers. This group of muscles originate from the spine, and run to the scapula. The primary scapular stabilizers are the rhomboids and trapezius. In addition to the rotator cuff and scapular stabilizers, the deltoid is another important shoulder muscles, found on the outside of the upper arm. 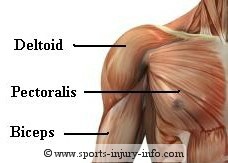 All of the muscles of the shoulder are attached with tendons. The rotator cuff tendons, and the biceps long head tendon are the most commonly injured shoulder tendons. Tendons are susceptible to tendonitis and other overuse injuries. Learn more about the shoulder tendons. The glenoid labrum is a type of fibrocartilage tissue that surrounds the rim of the glenoid fossa, and provides shock absorbtion at the shoulder joint. 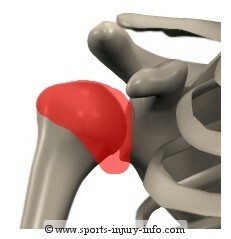 The labrum also helps to increase the depth of the "socket", making the shoulder joint a bit more congruent. Labral tears are often associated with shoulder injuries such as dislocations. Togther, all of the ligaments, bones, and muscles of the shoulder work together to provide stability and keep the shoulder working. Understanding shoulder anatomy is the key to prevention and treatment of shoulder injuries.